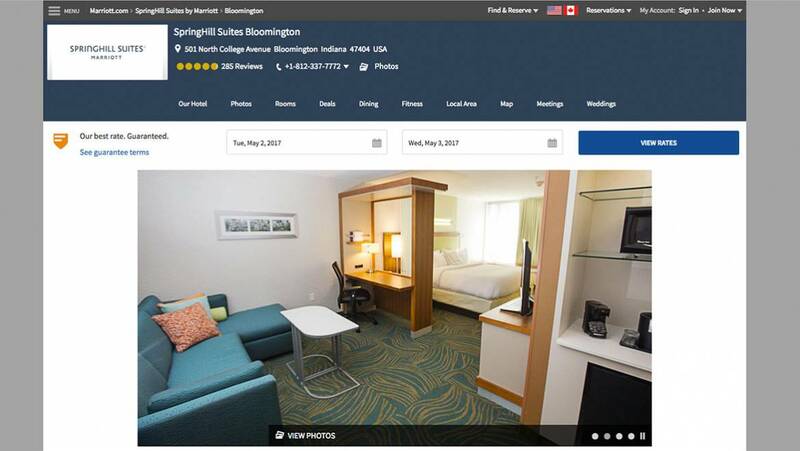 Book a spirited stay at SpringHill Suites Bloomington, conveniently located in the heart of downtown. Our stylish hotel in Bloomington, IN is just two blocks from the square and a short walk from Indiana University — ideal for football and basketball fans, potential students and visiting family members alike. The shops, bars and restaurants of Kirkwood Avenue are a 10-minute stroll away, and Bluebird Nightclub, one of the area’s top concert venues, is right around the corner. After a restful night in spacious suites featuring stylish decor and high-tech amenities, take advantage of our free hot breakfast, and come back at night for a cocktail or beer at our full-service bar. Keep up with your workout routine in our modern fitness center, and get refreshed and revitalized in our indoor swimming pool. Our Bloomington hotel also offers two flexible event rooms for memorable social gatherings and productive corporate events. Book your stay at one of the newest hotels in Downtown Bloomington today!